Karwa means a “pot” and Chauth tithi means 4th day of the lunisolar month. Karak Chaturthi is another name of Karwa Chauth. Mention of this festival is present in Vaman Puran. Women observe this fast for longevity, good health and success in the life of their husbands. They pray Lord Shiva, Mata Gauri, Lord Kartikeya and Lord Ganesh for granting long life and wellbeing of their husbands. This day married women spend their day in making special food items which they offer as bhog. 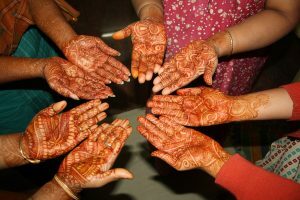 On the day of fast women apply mehndi or henna on each other hands. They also adorn themselves with beautiful ornaments.Generally wearing red or maroon color dress considered auspicious for the puja. In Punjab, women eat sargi early in the morning prepared by their mother in law and after that, they don’t have a drop of water until moonrise. Traditionally married women observing this fast wake up early in the morning. After taking bath they should recite this mantra for Sankalp. In the evening make the vedi of sand( balu) and write pepal tree.then place murti of Shiva, Parvati, kartikay, and Ganesh. Nowadays calenders of karwachuth vrat is available in market where all God and Goddess with peepal tree are shown. Then pray them with this mantra and do shodshopachar pujan. After praying offer the bhog of Laddo made of ghee, wheat flour, and raw sugar. When the moon appears, women will pray and offer water (arghya) from the earthen pot(karwa). With worshipping moon fast culminates and women break their fast by drinking water. In Punjab after sighting moon with the sieve, they also see their husband through the sieve and open their fast by drinking water from their husband’s hand. A long time ago in Shaakprasthpur, there was a Brahmin known as Ved dharma had seven sons and a daughter named Viravati. After marriage, she observed fast for the first time but could not tolerate the thirst and hunger and desperately wait for the moon to rise. Seven brothers felt pity for their only sister. Therefore, they lit a lamp behind peepal tree and with the help of sieve made it look like the moon has risen. When Viravati saw moonlight in the sky gave arghya. However, with the first morsel, she got a death news of her husband. She started crying and rushed to his husband’s place. On the way, she met Indrani. On requesting, Indrani informed her that their brothers created the false moon and her husband died because she broke her fast without the appearance of the moon. However, when Veeravati asked for the forgiveness, she instructed her to keep fast on Chauth of every month for one year. She kept fast for an entire year on the 4th day of the waning moon. On completing the fast with full dedication, her husband revived and they lived happily ever after. Furthermore, the importance of this fast is mention in Mahabharata.Lord Krishna advised Draupadi to keep this fast since Goddess Parvati observed this fast for Lord Shiva.Thus Draupadi observed this fast with full devotion. In the result, all Pandava got rid of their problems. Thanks a lot that u liked my post.I ll try to post this kind of post in future.thanks again for feedback. Wish you a happy and blissful Karwachauth. Hey Shikha .I just read your karwachauth vrat page and i must say it is a wonderful article to read .great work keep it up . Thanks for liking.it means a lot to me.wish you a happy and blissful karwachauth. Thanks for the appreciation.it motivates me to write.wish u a very happy karwachauth.